When Will the US Military End its Pattern of Destabilizing Entire Regions? We continue to see ourselves, as we have since 9/11, as victims, not destabilizers, of the world we inhabit. Let’s play a game, the kind that makes no sense on this single-superpower planet of ours. For a moment, do your best to suspend disbelief and imagine that there’s another superpower, great power or even regional power somewhere that, between 2001 and 2003, launched two major wars in the Greater Middle East. We’re talking about full-scale invasions, long-term occupations and nation-building programs, first in Afghanistan and then in Iraq. In both countries, that power quickly succeeded in its stated objective of “regime change,” only to find itself mired in deadly conflicts with modestly armed minority insurgencies that it simply couldn’t win. In each country, to the tune of billions and billions of dollars, it built up a humongous army and allied “security” forces, poured money into “reconstruction” projects (most of which proved disasters of corruption and incompetence) and spent trillions of dollars of national treasure. Having imagined that, ask yourself: How well did all of that turn out for this other power? In Afghanistan, a recent news story highlights something of what was accomplished. Though that country took slot 175 out of 177 on Transparency International’s 2013 Corruption Perceptions Index, though its security forces continue to suffer grievous casualties, and though parts of the country are falling to a strengthening Taliban insurgency, it has for some years proudly held a firm grip on one record: Afghanistan is the leading narco-state on planet Earth. Meanwhile, where there once was Iraq (171st on that index of kleptocracies), there is now a Shiite government in Baghdad defended by a collapsed army and sectarian militias, a de facto Kurdish state to the north, and in the third of the country in-between a newly proclaimed “caliphate” run by a terror movement so brutal it’s establishing records for pure bloodiness. It’s headed by men whose West Point was a military prison run by that same great power and its bloodthirstiness is funded in part by captured oil fields and refineries. In other words, after thirteen years of doing its damnedest, on one side of the Greater Middle East this power has somehow overseen the rise of the dominant narco-state on the planet with monopoly control over 80–90 percent of the global opium supply and 75 percent of the heroin. On the other side of the region, it’s been complicit in the creation of the first terrorist mini-oil state in history, a post–Al Qaeda triumph of extreme jihadism. Though I have no doubt that the fantasy of relocating Washington’s deeds to Beijing, Moscow, Tehran or any other capital crumbled paragraphs ago, take a moment for one more experiment. If this had been the work of any other power we thought less well of than we do of ourselves, imagine the blazing headlines right now. Conjure up—and it shouldn’t be hard—what the usual war hawks would be spouting in Congress, what the usual suspects on the Sunday morning talk shows might be saying and what stories cable news networks from CNN to Fox would be carrying. You know perfectly well that the denunciations of such global behavior would be blistering, that the assorted pundits and talking heads would be excoriating, that the fear and hysteria over that heroin and those terrorists crossing our border would be somewhere in the stratosphere. You would hear words like “evil” and “barbaric.” It would be implied, or stated outright, that this avalanche of disaster was no happenstance but planned by that same grim power with its hand on the trigger these last thirteen years, in part to harm the interests of the United States. We would never hear the end of it. 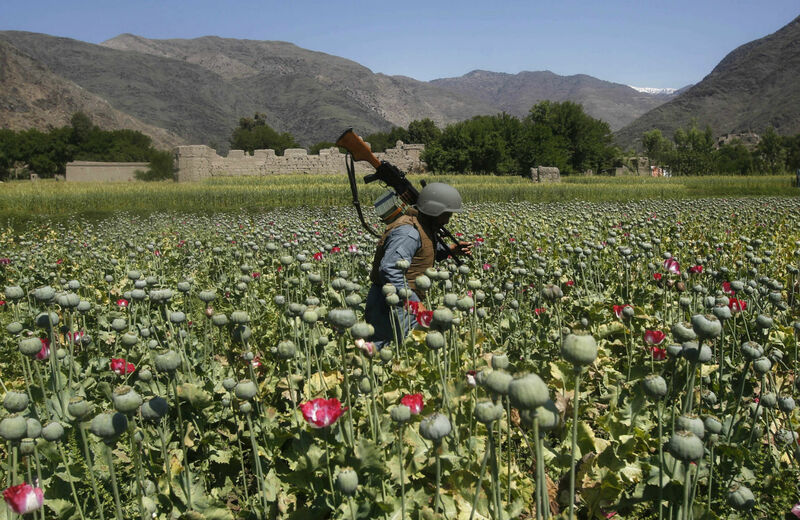 Instead, the recent reports about Afghanistan’s bumper crop of opium poppies slipped by in the media like a ship on a dark ocean. No blame was laid, no responsibility mentioned. There were neither blazing headlines, nor angry jeremiads, nor blistering comments—none of the things that would have been commonplace if the Russians, the Chinese, or the Iranians had been responsible. All in all, we’ve experienced a remarkable performance here when it comes to not connecting the dots or feeling the need to assign responsibility or accountability for what’s happened in these years. In some fashion, we Americans continue to see ourselves, as we have since 9/11, as victims, not destabilizers, of the world we inhabit. To add to this spectacle, the Obama administration spent endless weeks helping engineer a fraudulent Afghan presidential election—funded in part by the opium trade—into a new, extra-constitutional form of government. The actual vote count in that election is now, by mutual agreement of the two presidential candidates, never to be revealed. All of this took place, in part, simply to have an Afghan president in place who could ink a new bilateral security agreement that would leave US troops and bases there for a further decade. If another country had meddled with an election in this fashion, can you imagine the headlines and commentary? While reported here, all of this again passed by without significant comment. When it comes to a path “forward” in Iraq, it’s been ever deeper into Iraq War 3.0. Since a limited, “humanitarian” bombing campaign began in August, the Obama administration and the Pentagon have been on the up escalator: more air strikes, more advisers, more weaponry, more money. Two and a half weeks ago, the president doubled the corps of American advisers (plus assorted other US personnel) there to 3,000-plus. Last week, the news came in that they were being hustled into the country faster than expected—specifically into dangerous, war-torn al-Anbar Province—to retrain the American-created, now thoroughly sectarian Iraqi army, reportedly in a state of remarkable disarray. In the meantime, Chairman of the Joint Chiefs of Staff General Martin Dempsey, the Pentagon and the White House continue to struggle over whether American boots can be put on the ground in a combat capacity and, if so, how many and in what roles in a “war” that essentially may have no legal basis in the American system of government. (Shades of Afghanistan!) Of course, much of this internecine struggle in Washington is likely to be obviated the first time US advisers are attacked in Anbar Province or elsewhere and boots end up hitting the ground fast, weapons firing. For those of a certain age, the escalatory path the Obama administration has set us on in Iraq has a certain resonance and so, not surprisingly, at the edges of our world, familiar words like “quagmire” are again rising. And who could deny that there’s something eerily familiar about it all? Keep in mind that it took less than three years for the Kennedy administration to transition from the first several hundred American advisers it sent to Vietnam to work with the South Vietnamese Army in 1961 to 16,000 armed “advisers” in November 1963 when the president was assassinated. The Obama administration seems to be in the grips of a similar escalatory fever and on a somewhat similar schedule, even if ahead of the Vietnam timetable when it comes to loosing air power over Iraq and Syria. However, the comparison is, in a sense, unfair to the Kennedy and Johnson administrations. After all, they were in the dark; they didn’t have a “Vietnam” to refer to. For a more accurate equivalent, you would have to conjure up a Vietnam scenario that couldn’t have happened. You would have to imagine that, in May 1975, at the time of the Mayaguez Incident (in which the Cambodians seized an American ship), just two weeks after the South Vietnamese capital Saigon fell, or perhaps even more appropriately in terms of the dual chronologies of the two wars, in December 1978 when the Vietnamese invaded Cambodia, President Gerald Ford had decided to send thousands of American troops back into Vietnam. Inconceivable as that was then, only such an absurd scenario could catch the true eeriness of the escalatory path of our third Iraq war. Try to imagine the reaction here, if the Russians were suddenly to send their military back into conflict-ridden Afghanistan to refight the lost war of the 1980s more effectively, bringing old Red Army commanders out of retirement to do so. There is also at least some equivalency in the inability of American leaders and commanders to bring the nature, or even the numbers, of the enemy into sharp focus. Only recently, for instance, General Dempsey, who has played a crucial role in the launching of this latest war, rushed off on just the sort of “surprise visit” to Baghdad that American officials often made to Saigon to proclaim “progress” or “light at the end of the tunnel” in the Vietnam War. He met with American Marines at the massive US embassy in that city and offered an assessment that seemed to capture some of Washington’s confusions about the nature of its newest war. Despite their sudden access to crystal balls some eleven and a half years after the initial invasion of Iraq, such estimates should be taken with a grain of salt. They reveal less a serious assessment of the Islamic State than just how shaky America’s top leadership, civilian and military, has become about what the United States is capable of achieving in the wake of an era of dismal failure in the Greater Middle East. Given all this, it should amaze us how seldom the dismal results of America’s actions in the Greater Middle East are mentioned in this country. Think of it this way: Washington entered Iraq War 3.0 with a military that, for thirteen years, had proven itself incapable of making its way to victory. It entered the latest battle with an air force that, from the “shock and awe” moment it launched fifty “decapitation” strikes against Saddam Hussein and his top officials and killed none of them but dozens of ordinary Iraqis, has brought none of its engagements to what might be called a positive conclusion. It entered battle with an interlocking set of seventeen intelligence agencies that have eaten the better part of a trillion taxpayer dollars in these years and yet, in an area where the United States has fought three wars, still manages to be surprised by just about any development, an area that, in the words of an anonymous American official, remains a “black hole” of information. It has entered battle with leaders who, under the strain of fast-moving events, make essentially the same decision again and again to ever worse results. In the end, the American national security machinery seems incapable of dealing with the single thing it was built to destroy in the 9/11 period: Islamic terrorism. Instead its troops, special ops forces, drones and intelligence operatives have destabilized and inflamed country after country, while turning a minor phenomenon on the planet into, as recent figures indicate, an increasing force for turmoil across the Greater Middle East and Africa. Given the history of this last period, even if the Islamic State were to collapse tomorrow under American pressure, there would likely be worse to come. It might not look like that movement or anything else we’ve experienced thus far, but it will predictably shock American officials yet again. Whatever it may be, rest assured that there’s a solution for it brewing in Washington and you already know what it is. Call it Iraq War 4.0. To put the present escalating disaster in the region in perspective, a final analogy to Vietnam might be in order. If, in 1975, you had suggested to Americans that, almost four decades later, the United States and Vietnam would be de facto allies in a new Asia, no one would have believed you, and yet such is the case today. The Vietnamese decisively won their war against Washington, though much of their country was destroyed and millions died in the process. In the United States, the bitterness and sense of defeat took years to recede. It’s worth remembering that the first president to launch a war in Iraq in 1990 was convinced that the singularly tonic effect of “victory” there was to “kick the Vietnam Syndrome once and for all.” Now, all of official Washington seems to have a postmodern, twenty-first-century version of the same syndrome. In the meantime, the world changed in few of the ways anyone expected. Communism did not sweep the Third World and has since disappeared except in Vietnam, now a US ally, tiny Cuba and that wreck of a country North Korea, as well as the world’s leading state on the “capitalist road,” China. In other words, none of the inflamed fears of that era panned out.